WOOOO have given some great advice. 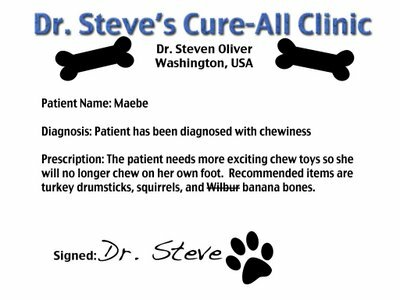 I think Maebe needs some help diagnosing her foot problem. She treats her feeties like chew toys. It is really quite disturbing. Maebe, I hope this helps. I also want to see some pictures of you with your new chew things. If you need a recipe for banana bones, look under the Kat's Crazy Kitchen section of our sidebar.